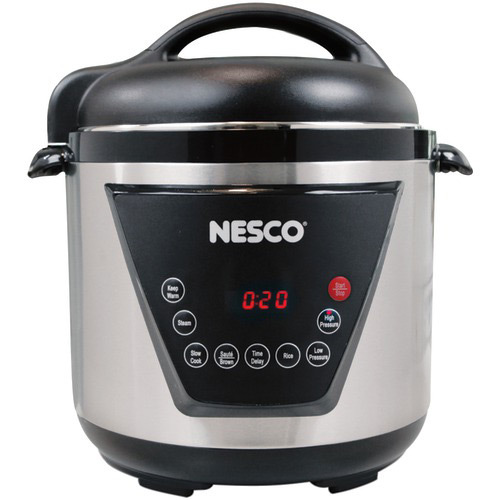 The Nesco PC6-13 is a 6-quart Multifunction Pressure Cooker allows you to pressure cook, brown, saute, slow cook, steam and make rice. It comes with a cooking rack, measuring cup, spoon and condensation drip cup. Among its great features are a self-locking lid with automatic pressure release and cool-touch lid and handles. The Nesco Multi Function 6 Quart Premium Pressure Cooker has many exciting features for users of all types. You can extend the lifetime of your Nesco Multi Function 6 Quart Premium Pressure Cooker with the purchase of a FactoryOutletStore Factory Protection Plan. 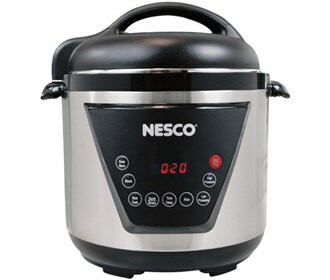 See the Nesco Multi Function 6 Quart Premium Pressure Cooker gallery images above for more product views. The Nesco Multi Function 6 Quart Premium Pressure Cooker is sold as a Brand New Unopened Item.